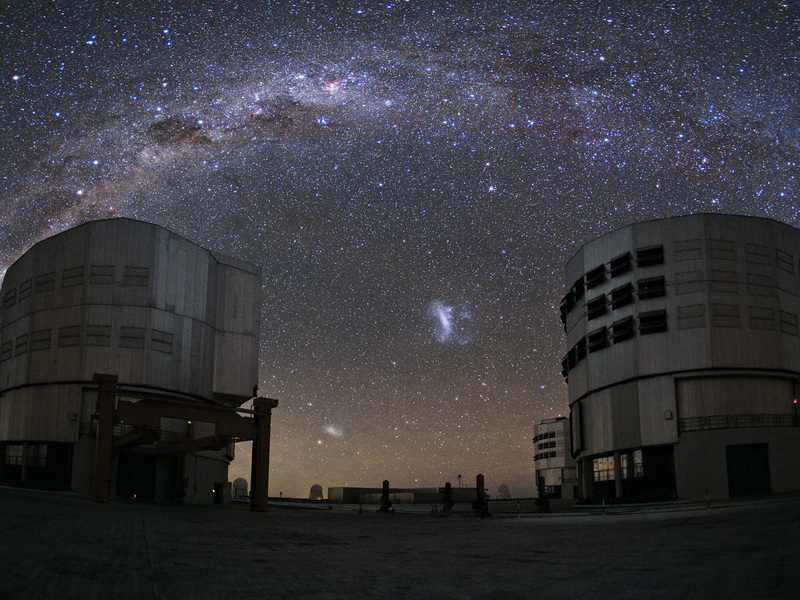 Sitting atop Cerro Paranal high above the Atacama Desert in Chile, two of the Very Large Telescope's Unit Telescopes quietly bask in the starlight, observing the Milky Way as it arches over ESO's Paranal Observatory. Several interesting objects can be seen in this picture. 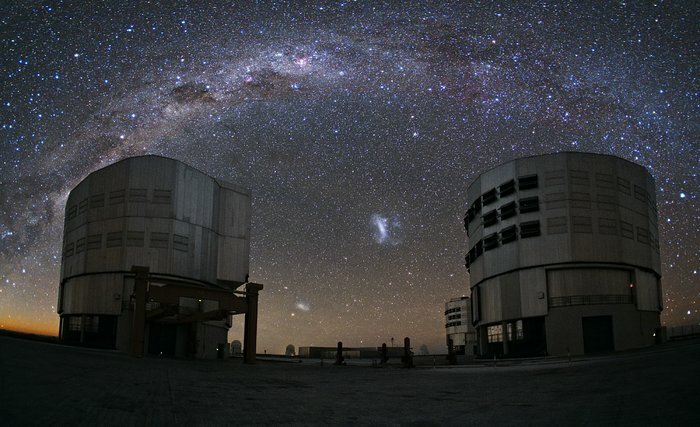 Some of the most prominent are the two Magellanic Clouds — one Small (SMC), one Large (LMC) — which appear brightly in between the two telescopes. By contrast, the dark Coalsack Nebula can be seen as an obscuring smudge across the Milky Way, resembling a giant cosmic thumbprint above the telescope on the left. 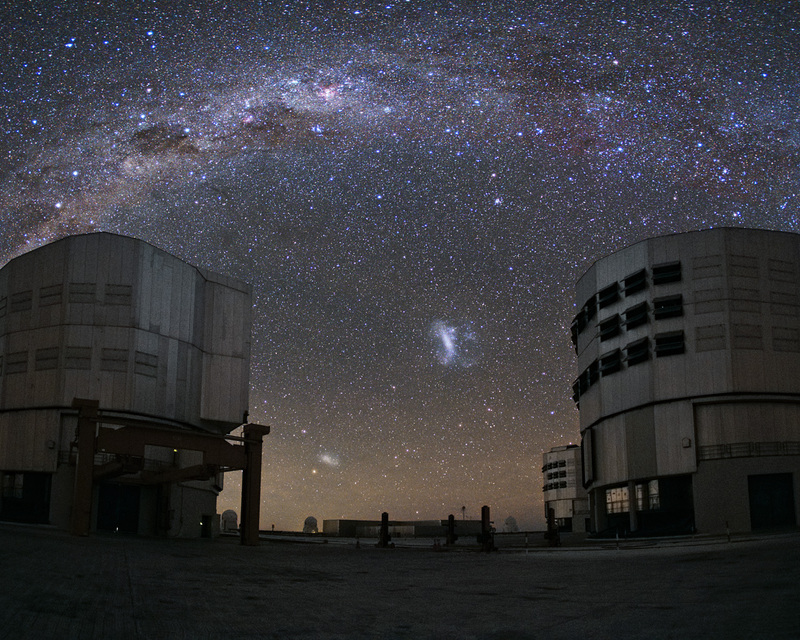 The Magellanic Clouds are both located within the Local Group of galaxies that includes our galaxy, the Milky Way. The LMC lies at a distance of 163 000 light-years from our galaxy, and the SMC at 200 000 light-years. The Coalsack Nebula, on the other hand, is a mere stone's throw away in comparison. At roughly 600 light-years from the Solar System, it is the most visible dark nebula in our skies. The Coalsack has been recorded by many ancient cultures, and is identified as the head of the Emu in the Sky by several indigenous Australian groups. Aboriginal Australians are most likely the oldest practitioners of astronomy in the world, and they identify their constellations by use of dark nebulae — as opposed to stars, as is the Western tradition. 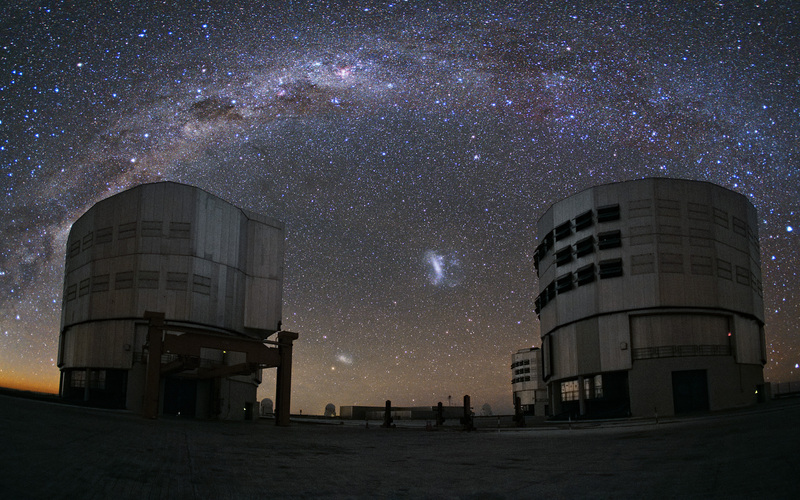 In the Southern hemisphere, these dark clouds are more prominent than in the Northern sky. Other cultures also had dark constellations — for example, the Inca in South America. A particularly important constellation to the Inca astronomers was one known as Urcuchillay (The Llama), representing the significance of the animals in their culture as a source of food, wool, and transport. This image was taken by ESO photo ambassador Yuri Beletsky.